There’s no business like snow business, espically when looking at French ski resorts with guaranteed snowfall so when the white stuff’s in plentiful supply, you can put on those skis and indulge in this time-honoured sport. For snow-sure resorts, France delivers in abundance with many towns and villages offering swift access to the best conditions. Mountainous alpine getaways above 2000 metres that also have north-facing slopes guarantee the powder you crave, so, let’s look at the best French alps towns and villages for a flying high ski holiday. What is The Highest Ski Resort in France? 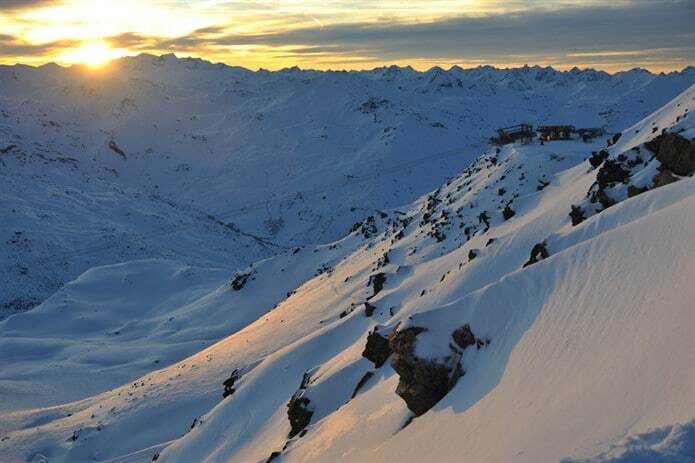 Val Thorens is not only the highest in France but also in Europe. The village sitting at an altitude of 2,300 metres has easy access to high ski lifts at 3,200 metres. While height plays a large part of snow-sure seasons, its north-facing slopes also provide fantastic terrains for experienced skiers. Out of all the resorts, Val Thorens is a guaranteed cert for long skiing seasons. For peaks and slopes, Val d’Isère has it all: an attractive village, classy bars, restaurants and landscape views worthy of gracing pages of any travel magazine. However, that’s not all this world-famous resort offers its loyal army of visitors because snow doesn’t melt during the ski season. Pissaillas Glacier reaches 3300 metres, with one slope dipping below 2500 metres. To top it all off, take in fabulous views of the Grande Casse and Mont Blanc. At an altitude of 1800 to 2100 metres, La Plagne’s purpose-built villages ensure you’re already sky-high in the Paradiski area even before you jump in the chair-lift. Belle Plagne (2050 metres) offers convenient access to Bellecôte and Chiaupe glaciers, which stretches across the 3417-metre-high Bellecôte Mountain. Here you’ll whiz down a black or red slope, kept cold and fresh by an average of 4.5 to 5 metres of snowfall a year. If you buy in Arc 1950 or Arc 2000, you’ll have direct access via chair lifts to the Paradiski area’s unbeatable altitude, with 70% of its runs above 2000 metres. And being located high above sea-level, both villages are nestled inside a north-east facing bowl, preserving snow well into springtime. Towering over manmade structures below is Aguille Rouge, which rises to a peak of 3225 metres and offers visitors easy access to Glacier du Varet. Les Arcs also offers night skiing facilities for those who can’t relax after dark. Sat at an altitude of 1035 metres, Chamonix wins no altitude bragging rights but it has one ace up its sleeve. Not only do surrounding areas and its six glaciers reach heights of 3300 metres, but the valley is also the biggest in western Europe. High, north-west-facing slopes, on the Argentière glacier in the Grands Montets ski areas ensures skiers can shred powder until May. When looking at quality, it’s all about location, lifts and infrastructure. 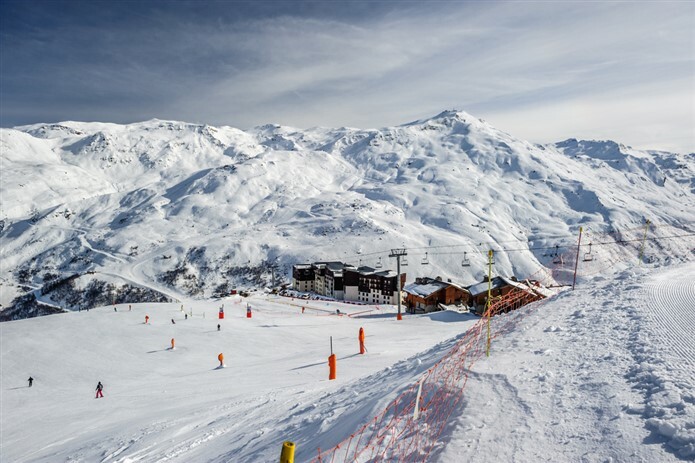 In 3 Vallées, Les Menuires has the world’s largest linked ski area right on its doorstep. With most pistes being high-altitude (2000 metres+), and one whole side of the Menuires valley facing north, snow is not in short supply here. The slope sweeps down from Val Thorens above and surrounding glaciers, including Péclet, Thorens, Bouchet and Pointe Renod, ensure a healthy season from November right through to May. Avoriaz, at 1,800 metres goes up to snow-sure landscapes at 2,466 metres. Sitting in the Portes Du Soleil region, one of the world’s most extensive ski terrains, Avoriaz also connects with Chatel and Chamberry via gondolas. A hard-core skier will be in their element once they catch sight of 650 kilometres of pistes suiting those who want to learn to ski and experienced lovers of the sport. Newcomers should sign up with a ski school, but the bonus is that stunning landscape views are also yours for the taking. With an average fall of 8 meters of snow every winter, Avoriaz also opens 38 kilometres of cross-country skiing and is one of many mountain resorts offering heli-skiing lessons and sessions. 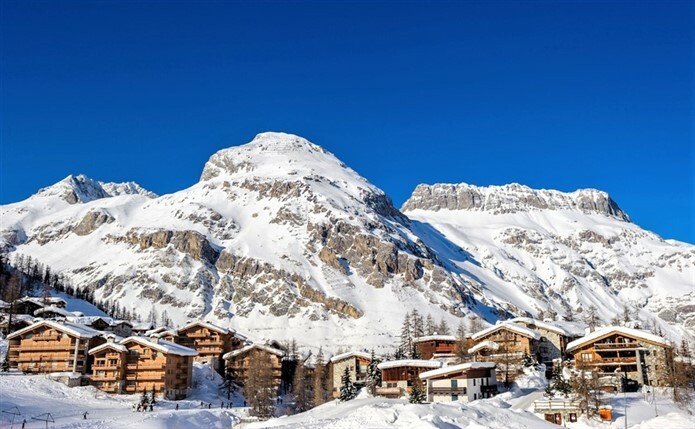 Five villages of Tignes sit between 1550 to 2300 meters, but the best ski terrain excels at 3,456 meters. It is a sure-fire bet for guaranteed snow conditions in the Espace Killy area that attracts skiers from all over the world. The highest village, Val Claret, faces west so also gets much sunshine but snow machines keep powder turning. Deciding where to go in Tinges, is just a matter of lifestyle preferences because all villages each have their characteristics, and off-piste activities. More about Tignes and its five communities. Courchevel attracts attention for the off-piste and après-ski social scene, but the splattering of communities formed over altitude between 1300 to 1750 metres, provide easy access to 2,700-meter lifts. Courchevel 1850, the highest village also has pistes running through it, making it ideal for ski-in, ski out accommodation. Any skier has 150 kilometres of runs to test, and terrains of the Three Valleys. Which Mountain Resorts are Best for Snowboarding? High altitude slopes suit everyone but for snowboarding, look at Tignes, Courchevel, Les Arcs and Alpe D’Heuz who all embrace alternative sports with open arms. Newcomers should take their snowboard to one of many ski schools who rate snowboards just as important as skis. 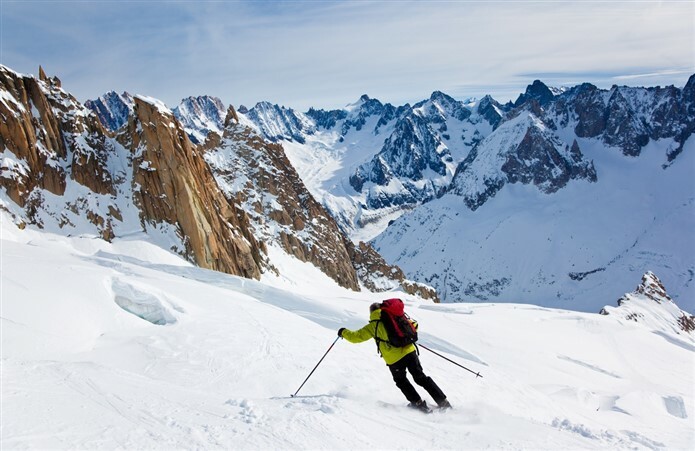 Best Skiing Resorts for Beginners: It’s ok looking at French ski resorts with guaranteed snowfall but some stand out more than others as ideal places for beginner skiers, who need easy, downhill runs, schools, ski lessons and a qualified instructor to help them get on the slopes. Best Luxury Ski Destinations in France: Which towns and villages earn worldwide recognition for their upmarket hotels, villa rental, shops, facilities, restaurants and social scene? Tips on Buying French Alp Property: Navigating the real estate market in France is different to that of your home country so what should you know when hunting for an alpine house?